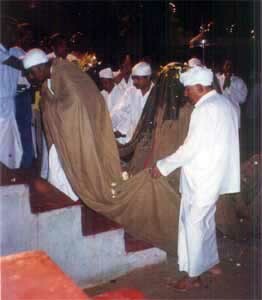 Dromena or mystery rite at Kataragama: A Kapurala shaman-priest (at right, shrouded under canvas) embodies the unseen god as he bears the tiny casket believed to contain the yantra, or rather the god himself, and prepares to mount Swami upon the tusker's back. Kataragama, the Kailasa of the Hindus, the Mecca for the pilgrims of all faiths, the haven of spirituality and sanctity was deified millennia ago as a repository of divine power. Pilgrims entering the holy shrine have felt this power. They are carried as it were by an invisible current that stirs the innermost depth of their souls to feelings of awe and reverence. Where does this divine power resides? Is it in sanctum sanctorum that is heavily veiled by many curtains. "They are the thin partitions their bounds divide" from the worshippers of the holy God. You may perhaps think that there is an image or idol of god Kataragama behind those curtains; but no such image exists there, but there is a yantra (mystic diagram) engraved in a tablet of gold and enclosed in a casket where the divine power is supposed to reside. God Kataragama moves in strange ways. Out of pity for human suffering, often hearing "the sad music of humanity." He appears as the youthful God of compassion. He takes the form of god of war when wicked Titans have to be destroyed; he takes the form of the holy child Muruka omnipresent at the service of his devotees. 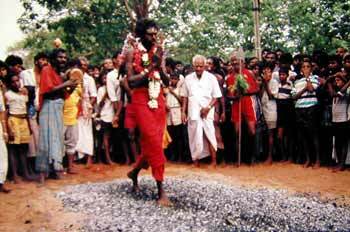 A day prior to the termination of the festival fire walking ceremony takes place. Some devotees are inspired by the deity for an exhibition of divine power to walk on the glowing embers of fire. The inspiration comes to them as a yearning from within to join the band of fire-walkers. They bathe in the sacred waters of Menik Ganga (River of Gems) at dawn and as they step into the forty feet of fire track, without getting their feet burnt, to the amazement of the spectators. 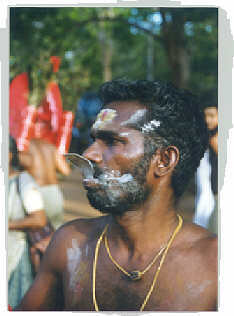 Some devotees perform certain penances by piercing their tongues, cheeks and other parts of their bodies by silver vels. When the vels are removed by specialists who besmear them with vibhuti (holy ash) they become immune from pain and miraculously cured within a short time. Some devotees perform certain other penances attaching iron hooks to their backs and pulling big loads. The most common occurrence in almost every festival is the loss of children in the surging crowds. Even the days before loud speakers, when a child is lost, by tying a pandura; speedy recovery of the lost child is brought back in a mysterious manner. At the time he was in service, he was suffering from both physical and mental ailments. Physical, since he was suffering from a chronic skin disease.  To get rid of it he took treatment from the most eminent physicians of his day in Ceylon. He was mentally upset, because his promotions were withheld and he was superseded by local men from lower ranks. As a last resort, it is said that he was induced by his own clerk to visit Kataragama during the season. He did make a pilgrimage and took a vow at the holy kshetra of Kataragama. At that time he was working in the Badulla Kachcheri. After the festival when he returned to Badulla, a pleasant surprise awaited him. There was a telegram from the Colonial Secretary asking him to proceed to the Northern Province as a civil servant. Thus his mental agony was cured. When he went to his bungalow in the Northern Province, his close neighbor was an old Ayurvedic physician who came on his own accord to treat him. In a few days he was cured of his severe disease. Article from The Island (Colombo) published in 1989 (no date).